No Fish-No Charge is only valid on 8 Hour Trips aboard the 36ft Tiara! Walleye and Smallmouth trips are charged at the same rate. We require the 100% deposit due to the fact that these are destination trips and we have lodging expenses as well to be able to make these spectacular trips possible for our clients. Deposits are not refundable and cancellations must be made more than 60 days prior to your scheduled date of departure to move your trip anytime we have availability during the same season. If you are looking for lodging we can help you get lodging at Lindberg’s Cove & Resort if available. We have been staying at the Resort for years now and look forward to it every year. The cabins are very clean and comfortable; there is nothing better than waking up and looking out over the bay! Being right on the water makes it very convenient to simply park the boat and walk 50 feet to your cabin door. You can find more information on Lindberg’s Cove Resort here. If Lindberg’s is booked for the time that you will be in Gladstone Michigan fishing with us, we will gladly get you phone numbers of other resorts in the area. We have a World Class Brown Trout fishery in Milwaukee, Racine and Kenosha throughout the winter ice-fishing season. 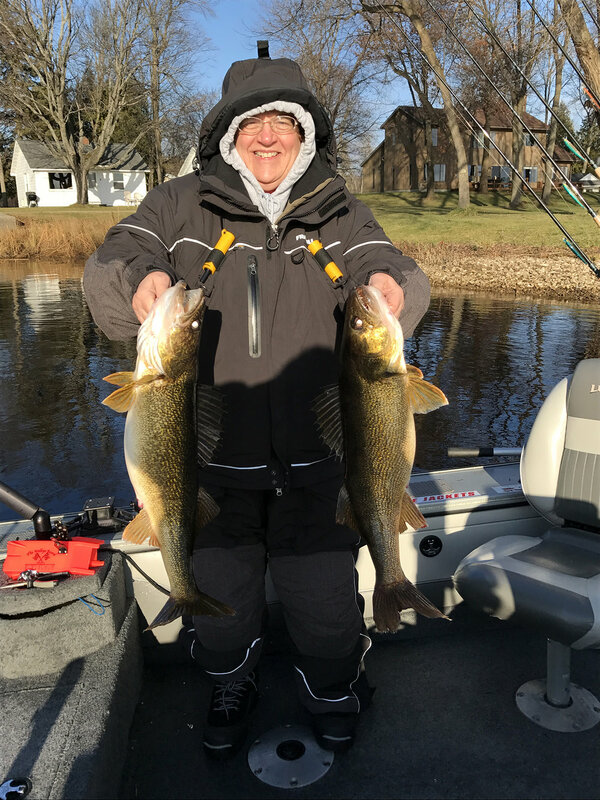 Jack’s fishes in the Milwaukee, Racine and Kenosha harbors and marinas for both Trophy Brown Trout and Rainbow Trout/Steelhead throughout the ice season. We utilize Automatic Fisherman that are set up in proximity to our heated Frabill ice shacks, we also provide jigging rods for those that want to jig in the shelter. We supply all the rods, reels, tackle and bait that is needed for a successful ice fishing trip! Jack’s guided Ice fishing trips usually start at 7 A.M.
We offer guided trips for Brown Trout, Steelhead, Salmon, Walleye and Smallmouth on our new 2018 21 ½ foot Ranger. These trips are for 1-2 people for 5 hours, but we do have longer trips that are available. We can also add a 3rd person for an additional cost. 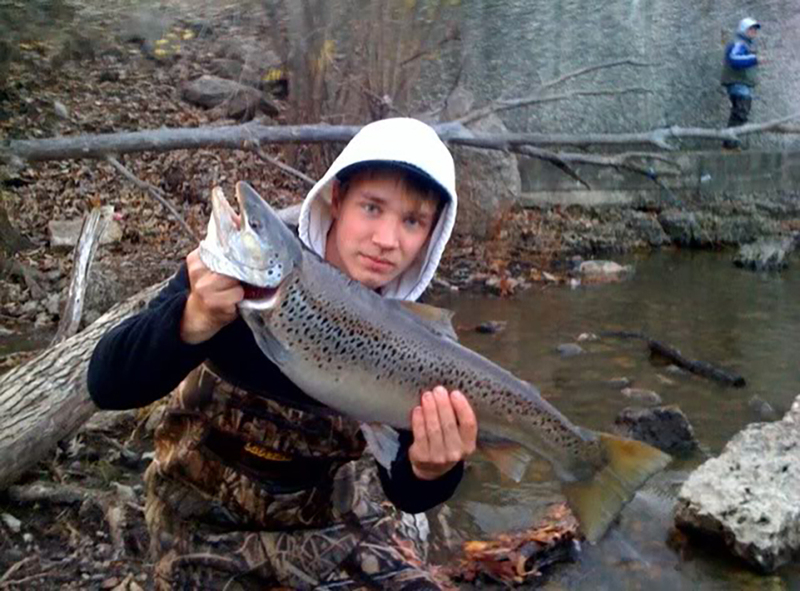 We have a World Class Brown Trout fishery in Milwaukee Wisconsin from October through May. We have all of the Rods, Reels and baits that will be needed for your fishing trip. We have a World class Brown Trout and Steelhead fishery in Milwaukee and Racine Wisconsin. Jack’s Charter Service fishes the Milwaukee and Root River as well as the Milwaukee and Racine Marinas. Your group will have individual attention from one of our licensed and insured guides and or captains to ensure your success and safety. Jack’s has all of the rods, reels and tackle and bait that will be utilized during your guided trip. Guided River Trips are 5 hours in length and are charged per person. • Evening on the Leader watching the Milwaukee Fireworks from the water. An applicable gas surcharge may be added if fuel prices in the marina should suddenly rise. Cash, Visa, Mastercard, American Express and Discover Card are the only forms accepted for payment. 50% deposit is due at the time of booking your trip. Add 5.6% Wisconsin sales tax to all of the trips. A 3.75% convenience fee will be added to your bill for all non-cash payments. Deposits are not refunded but may be transferred to another date during the same season, provided it is done more than 14 days prior to departure. If you cancel your charter less than 24 hours before your charter do not show up for your charter the entire amount of your charter will be charged on your credit card. Our No Fish- No Charge policy applies only to our 8 hour fishing charters. Late arrivals and charters cut short due to seasickness do not apply. Charters cut short due to seasickness are charged the FULL price. No refunds on any gift certificates.